Whether you’re a fan of Apple’s walled garden ecosystem or not, it’s hard to deny that the California-based tech giant is a master at making its products objects of desire. Every new hardware revision or software release sets the internet alight with articles and forum posts; every new slab or screen or wearable instantly becoming the next benchmark to which others must rise. Apple exudes cool and commands an effortless air of desirability that make the brand a marketers dream and a competitor’s nightmare…but it wasn’t always like this. Back in those days before Retina screens and magic mice, Apple was a totally different proposition. In those halcyon days of beige towers and PowerPC architecture, Apple was asking people to "Think Different" by buying into its vision, and while these days it’s all flashy keynote speeches and celebrity-packed product reveal events, there was a time when not everything Apple touched was guaranteed to turn to gold. Now, while it’s true that Apple has dabbled more in the gaming market than ever before in recent years, what with the App Store and the ability of iOS to run a wide array of games and game-like apps, the firm has been conspicuously absent from the more traditional gaming sphere. This is more likely down to the fact that the other players in the gaming industry have the market pretty much sewn up at this point, but there was a time when Apple did actually dabble in the sector and came away with more than a little egg on its face. In fact, it was more like an entire farm’s worth of yolk. So join T3 as we take an in-depth look at that time Apple teamed up with toy manufacturer Bandai and unleashed upon an unsuspecting world one of the biggest financial disasters in gaming history: the Apple Bandai Pippin (also called the Pippin Atmark and, later, Pippin @world). But was it a total failure? We’d wager certainly not - especially in terms of design aesthetic and ambition, and here T3 explains why the Pippin may not have been the success Apple and Bandai projected but neither was it the dumpster fire many make it out to be. To truly understand the ‘point’ of the Pippin system, one must first learn about the slightly bizarre choice of names the Apple computer company slapped on its hardware. The Apple Macintosh was named after the McIntosh genus of apple, a large green and red fruit that is native to the farms of Canada and New England. Naturally wanting to be as obtuse as possible, Apple decided to name the smaller, more wallet-friendly version of its popular desktop range after a smaller variety of apple - the Pippin. In retrospect, this makes perfect sense, simply because the Pippin is a Mac without the bells and whistles. A PowerPC-equipped box designed to deliver multimedia to the user who didn’t have the budget to stretch to an Apple Power Macintosh desktop. The Pippin technology actually has its roots (no pun intended) in an earlier initiative, where ‘Pippin’ was actually more of a multimedia delivery platform that could be utilised by various manufacturers and incorporated into educational computers and multimedia boxes. It was essentially Apple’s version of the 3DO vision of a single VHS-style platform that was licensed out to hardware manufacturers for implementation in their edutainment devices. Almost like a very early version of the eMac but without the back-breaking weight. It appears Apple decided that the correct way to harness the potential of its new-fangled technology though was to strike a deal with toy giant Bandai and launch Pippin - packaged up as a consolised mini computer - in the previously untapped market of Japan. Again, with hindsight this also makes a lot of sense - back in the early 1990s, Apple was trying to get into the lucrative Japanese market and the Mac range really wasn’t doing a lot in the territory. With a powerful home console/computer hybrid, bundled with a modem and web-browsing capability, the money was sure to print itself…right? Sadly, the reality didn’t match the dream and the Pippin received a somewhat unspectacular March 1996 launch. The console is rumoured to have sold less than 40,000 units in the year that it was officially supported and it garnered a software library of less than 20 games. When Apple and Bandai rebranded the Pippin Atmark as the Pippin @world for the US launch in September 1996 (also changing the colour of the console from white to black), the embarrassment went even further - around 20,000 Pippin @world systems are believed to have been sold at retail. 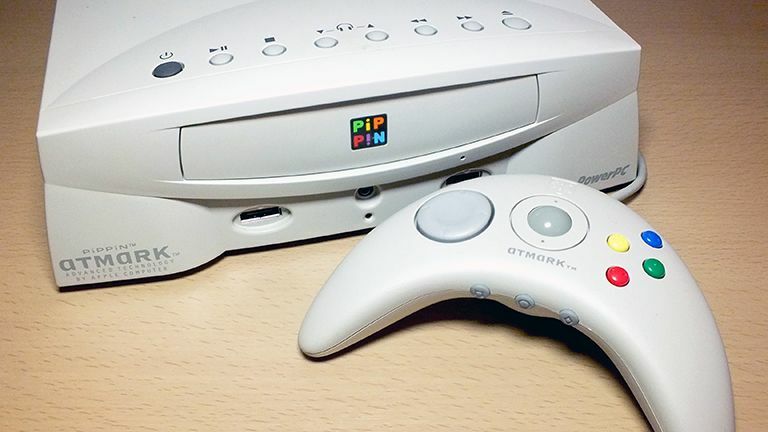 With considerable competition from the Sony PlayStation, Sega Saturn, Nintendo 64 and even the 3DO and Jaguar, the Pippin was lost in a deluge of competition. In 1997 the Pippin project was quietly cancelled and literally nobody noticed. Since then, the Pippin Atmark has gained almost mythical status as the console Apple made and that nobody bought. The low sales of the console have undoubtedly had an impact on the rarity of the Pippin today, with Japanese Atmark units regularly fetching upwards of £300 on auction sites like eBay; and the even rarer US Pippin @world machines going for over £1000. The Apple Bandai Pippin is one fine looking piece of equipment, however you look at it. Viewed from above, it’s an almost perfect square, with the rear half of the system’s shell perforated with 540 tiny holes that act as ventilation inlets. The front portion of the system’s top plays host to the rubberised operation controls, with each little nub having a reassuringly squishy nature - but lacking the definite click of a microswitch hidden beneath. These controls are fairly standard, with an on/off button identified by the universal marking and a black button; while other controls are afforded dark grey buttons along with the corresponding familiar semiotic trappings. There’s a play/pause button, along with stop, fast forward, rewind and the obligatory eject. Sandwiched between these are the headphone volume controls. Moving down to the front panel, the Pippin Atmark features a deep CD draw emblazoned with the colourful Pippin logo, which is in turn seated upon a broad sweeping lip that almost makes the system appear as if it is smiling at you - perhaps this is a nod to the smiling face of the Mac OS Finder icon…or perhaps I’m reading far too much into 1990s industrial design. Moving further down the front panel, the two controller ports sit astride a central 3.5mm headphone jack, while further out two pillars - one either side - announce proudly the marque of the technology beating inside the console. On the right, the PowerPC logo; on the left, the Atmark name followed by the almost boastful claim of ‘advanced technology by Apple Computer’ promised within. The sides of the unit are fairly unremarkable, but when we get around to the rear of the Pippin we are treated to a truly wondrous array of connection ports for a system born of the mid 1990s. Moving from left to right we are greeted with a three pin power socket and a fan vent. Next to this is a VGA out socket, which in turn is partnered by a curious three-way switch through which the Pippin’s output can be switched from the aforementioned VGA, to PAL to NTSC. This is truly unprecedented for a console of the era, and further hints at Bandai’s desire to market the Pippin as something more than a device that simply played games. Moving along further, we find the S-Video and RCA outputs, as well as audio inputs and finally ports for the optional fax and modem peripherals. But that’s not all, oh no. Turning the Pippin on it’s back like some kind of beige, plastic turtle presents the discerning user with another couple of ports. One - the larger of the two - is hinged and allows for the installation of an optional 2, 4 or 8MB RAM upgrade that is referred to on numerous occasions in the web browser manual and allows for the Pippin to run Mac OS. The second - and slightly more narrow - port reveals an expansion connector that is intended for use with the additional Pippin floppy disk drive. Dimensions wise the Pippin Atmark measures 13.5 x 13.4 x 8.9 inches, but the most startling thing about this console is the weight - a pretty hefty 3.5kg/7.6lb. Now this may not sound like much, but when you consider this is exactly what the PS4 Pro weighs, you’ll appreciate that the Pippin is no waif. With this in mind, it’ll come as no surprise that the Pippin feels like a very solidly built unit, and with this weight and connectivity comes the assurance that unlike other gaming machines of the period, Pippin was designed to do so much more than simply entertain. The Pippin’s controller is, rather awesomely, called the Applejack. Resembling a crescent moon, or a boomerang depending on your preference, there’s no denying that it also looks a lot like the early PlayStation 3 controller design which is now lovingly referred to as…the boomerang. Much like the maligned Atari Jaguar controller, the Applejack falls into that category of peripheral that many may pour scorn onto for their unorthodox design, but when held in the hand are actually surprisingly comfortable and pleasant to use. The Applejack’s twin horn design allows for the unit to be gripped easily by two hands, and because the overall position of the hands on the controller is dictated by the position of the index fingers on the shoulder buttons, the diminutive size of the Applejack is a moot point. Indeed, the ‘prongs’ are long enough that hands both large and small are easily accommodated. With index fingers resting on the two (actually more central) shoulder buttons, the main face buttons and circular d-pad are easily reached by the thumbs. Perhaps the most interesting thing about the Applejack though, is the inclusion of a trackball right in the middle of the thing. Because of the Pippin Atmark’s home computer roots and machinations, the inclusion of such an input device is hardly surprising and in all truth it really makes a lot of sense when you consider that a fully upgraded Pippin was more than capable of running Mac OS variants of the era (and beyond, with the right know-how). The trackball doesn’t click in or do anything as fancy as that, but it does add a whole new dimension of control to a pad that is about as close to a mouse/joypad hybrid as we’re ever likely to get. The Pippin is certainly no slouch when compared to contemporary systems. Apple and Bandai’s plans to market the hardware as a cheaper alternative to a full-blown Apple Macintosh certainly impacted the overall technical specifications though, as it doesn’t really stand up to the Apple desktops of the era. That said, what’s there is pretty impressive for the time. We’ve already touched on the commendable number of output and display options, but beating inside the Pippin is a 66MHz PowerPC 603 RISC CPU. The figures speak for themselves and the Pippin’s PowerPC heart compares favourably against the 12.5 MHz ARM CPU inside the 3DO, the 33MHz R3000 PlayStation processor and the twin Hitachi SH-2 processors powering the Sega Saturn at 28MHz each. While it’s true that clock speed doesn’t equate to polygon-chucking grunt, the PowerPC architecture made the Pippin a far more flexible proposition when it came to things like shoehorning an operating system (Mac OS, naturally) onto the living room CRT television. The Pippin came with 6MB of RAM onboard as standard, shared between system and video operations, but the memory could be added to via the expansion port on the bottom of the system. Modules were sold (allegedly) in 2, 4 and 8MB flavours and in some cases an additional RAM module was required to allow certain software (including some web browser applications) to run. 16.7 million colours onscreen, a 4x CD drive and stereo 16bit 44KHz sound output make the Pippin a truly capable machine by 1996 standards. As well as the previously discussed Applejack (I’ll never tire of that name for a controller), the Pippin came packaged with a dial up modem as standard and a bunch of web browser CDs. When used in conjunction, this combo allowed Pippin owners to delve into the wondrous world of the internet, 1996-style. Further to this, the Pippin’s main internal memory was upgradeable via a selection of RAM modules and later a floppy drive add-on was released that sat under the console much in the same way the N64 DD or the Dreamcast karaoke unit sit under their respective host systems. Whether any dedicated floppy disc software was ever released is a little hard to discern, but when attached to a fully upgraded Pippin loaded up with Mac OS 7.5, the user could expect to use the floppy drive to save Apple Works documents like a demon. While not dedicated Pippin peripherals, the system was also capable of accepting Apple StyleWriter printers and an optional keyboard/graphics tablet device was also made available. One of the more interesting aspects of the Pippin’s operation is that the OS wasn’t actually included on the system; rather it was packaged as part of the CD that games or other software came on. Turning a Pippin on with no game in the drive will not allow a user to do anything but view an ‘insert CD’ animation; depicted by a truly Escher-esque drawing of a Pippin and a repeating childlike whisper of “Pippin.” Enough to give you nightmares, and make no mistake. From a sales standpoint, its glaringly obvious that the Pippin Atmark is a failure on a totally different plane than even its nearest rival. With an unconfirmed worldwide sales total of less than 60,000 units though, it has now become one of the rarest and most highly prized consoles for collectors. The games library is pitifully small and there are no killer app titles (due to hardware issues we weren’t able to test any for this feature, but watch this space); but due to this even the software has garnered highly desired status. However, even with these marks against the Pippin name, the console hardware itself is actually rather impressive for its time. The sheer number of display options, the upgradeability, the peripherals, the online functionality and the quality of the Applejack controller make us wonder that if the hardware had been handled by literally any other games company, could the Pippin have actually been a success? The same rhetorical questions could technically be asked of any failed hardware; for example what could have happened with the Jaguar if Atari had marketed it as a 2D powerhouse in line with the Neo Geo instead of going after the PlayStation? We’ll never know now, but a similar question could be asked of the Pippin. What if Apple had teamed up with another more well known partner? Attracted more well-known developers and positioned the Pippin as less of a cheap computer and more as a dedicated console? Either way, what we’ve learned during this investigation is that the Pippin isn’t really the laughing stock it has been painted as over the years. The hardware is capable, the technology sound and the range of peripherals is fantastic. With a little more forethought, the Pippin could potentially have been a contender rather than the dog’s dinner it became.